The host was very informative about the area and spoke great English. She also was very helpful in securing restaurant reservations at the area spots. Very basic breakfast, but did the job. 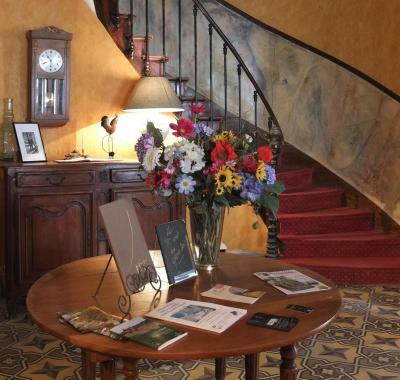 Its a beautiful old french hotel from a different era. Everything was great. Hot water, clean sheets, ambience, breakfast was super. Hostess was lovely. What's not to like. Perfectly located in the center of Chablis. Relatively easy parking on the streets outside the hotel. Great location, good 3-rated hotel, good breakfast as well as friendly and helpful staff! Good selection at breakfast, and the pastries were really nice, in particular, the croissants were flaky and comparable to the nearby bakery which was supposedly the best around! Staff were very helpful, especially in securing me a good deal for a cab to travel to Auxerre to catch my bus when I checked out. Lovely old world type Hotel its like time has stood still since the 70s think its a little past its former glory but with spiral staircases and a lovely chatty owner it has a lot of charm. Fantastic breakfast from cereals and pastries to fruit and boiled eggs, ham and cheeses. If you're there on a Saturday night make sure you stay and visit the Sunday morning market. 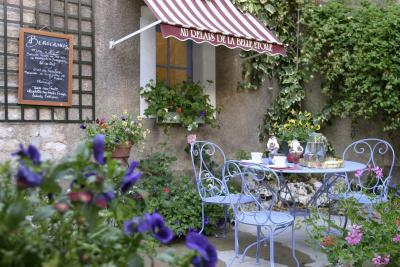 Lovely, quirky, quaint hotel - full of French charm. We loved it as soon as we walked into the reception/hall area. The receptionist was extremely warm, welcoming and helpful. Charming bedroom, comfy lounge, pretty breakfast room. Loved the Chablis tasting in the lounge whilst we were chilling out reading. Offered 3 different types to try from the comfort of our sofa which was great and only 8 euros each! 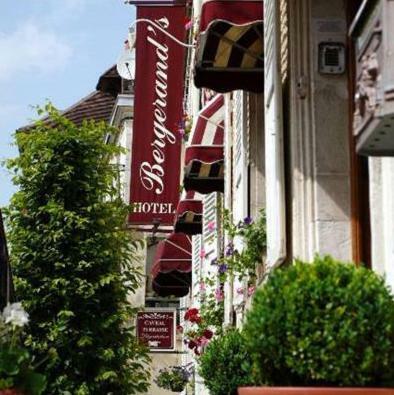 Located in the heart of Chablis, Hôtel Bergerand sits on the banks of the Serein River. This former coaching inn has been a temporary home for kings and queens, as well as famous people, artists and writers. The colorful rooms are all uniquely decorated and feature a private bathroom. A buffet breakfast is served each morning in the breakfast room. It is composed of assorted pastries, baguettes of the day and various breads (Gluten-free bread on request). Jams, local cheeses and fruit yogurts are also provided. Soft-boiled eggs, fruit and fruit juices can be served. Free Wi-Fi access is available throughout the hotel and wine tasting can be organized. Auxerre is a 20-minute drive from the property. When would you like to stay at Gites au Bergerand en plein coeur de Chablis? House Rules Gites au Bergerand en plein coeur de Chablis takes special requests – add in the next step! A private garage is available up and charges are applicable. If you plan on arriving after 18:00, please contact the property in advance in order to receive access codes. Contact details can be found on the booking confirmation. Please inform Gites au Bergerand en plein coeur de Chablis of your expected arrival time in advance. You can use the Special Requests box when booking, or contact the property directly using the contact details in your confirmation. Its a beautiful old french hotel. Enjoy it for what it is. Got the WiFi code from reception, but did not explain the entry code on the laminated card. So got locked out after dinner. Finally after much bell ringing, the dressing gown clad owner ? let us in with bad grace. Very grumpy. Secure parking was advertised on the website but that did not exist. 40 years ago we parked in the courtyard enclosed by 2 huge heavy doors....secure. Now there seems to be an effort at tables and chairs and a bed in the courtyard. Told to park in the street. That meant we had to unpack the car for security sake. Felt that the upkeep of the room could be better. The carpets could really do with some cleaning. Also a lack of basic amenities such as coffee and tea in the room. It seems that the electric kettle was at the bar outside of the room for communal use. Would be nice if each room has its own kettle to boil water. Rooms on the top have a very noisy Macerator electric toilet. Very rustic setting, but having no Air Conditioning in the rooms during August was not a good experience. You had to sleep with the window open, but then heard people in the streets till very late in the night. Having a small fan or anything to move air would have been helpful. 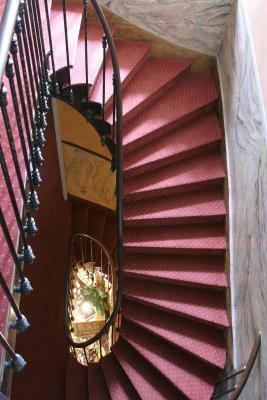 The hotel, even though traditional, is getting a little tired and the rooms could do with a refurbishment. If you like a huge choice for breakfast then this may not be for you. But more than met our needs-croissants, breads, jams, cereals, fresh fruit, yoghurts, eggs, ham and cheese, fruit juices. No restaurant (again didn't bother us) but plenty nearby though you need to book. Looked like the owner rather unfriendly. Didnt like dogs although accept them. The room we were in no 1 very shabby dirty small only assume it was because weve got a dog. V v disappointed. Even 3 stars shd b better than this. Rather expensive! 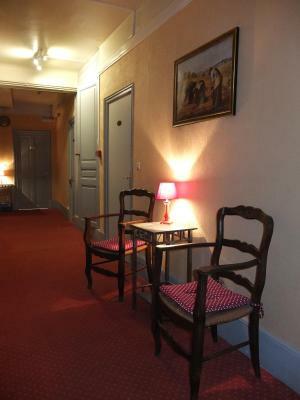 Great location for the town with a market on Sunday on your doorstep & a delightful bakers next door, excellent restaurants within a 5 minute walk, the hotel had its own unique French style of decor & plumbing! but it all worked. The best continental breakfast I have ever had with plenty of choice even including boiled eggs! If you like a "Faulty Towers" type of hotel with similar mismatching deco from the early 1980´s, but without the friendly service then this is for you. Quite a sad hotel, badly in need of some love and care but most probably in need of a total renovation. Perhaps the "For Sale" sign outside says it all. Madame called us while we were on route to the hotel to ask us how far away we were (7 pm), to which she replied that she might not wait for us since we were as much as 20 mins away so we would have to let ourselves in. Strange when it calls itself a hotel yet doesn´t operate as one? After breakfast this morning at 10.30 am no one was around to check-us out, even say goodbye, nor a simple thank you for staying with us. I actually hate saying bad things about hotels but this one cannot be classified as even pleasant and is way over priced at 110 Euros. If she had charged maybe max. 60 Euros it would have been ok considering how bad a state the hotel is in. NO LIFET-OLD HOTEL, i BOOKED THROUGH Booking which was not the est deal by the way but i was running our of time, and breakfast was not included. i found that forthe value of money breakfast should have been included . i was offered to pay even for 2 and my 6 years old for free, but i decided to out buy croissant and have a coffee out which was ok. i hope booking .com would rethink the breakfast and included in their prices!